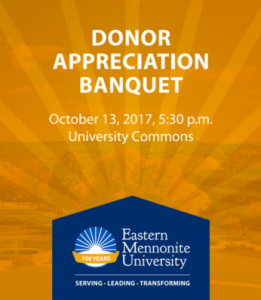 A record crowd of nearly 450 attended the donor banquet Friday evening at Eastern Mennonite University’s Centennial Homecoming and Family Weekend. This year’s banquet was scheduled between a host of other Centennial-related activities: many guests came across University Commons from the Margaret Martin Gehman Gallery which hosted an art exhibit reception, and an expedited program after the dinner left time to walk across campus to Lehman Auditorium for an evening performance of the Centennial play. Huxman offered listeners an overview of the institution’s Centennial history, drawing four parallels between the pioneers of 1917 and those carrying on the legacy in 2017. Creation care was important then, with one of the first standard courses offered being soil study and crop production, and now, as EMU curriculum and facilities continues to prioritize sustainability. The university’s first woman president also pointed out that the class of 1917 included four women and three men, learning together in a co-educational environment long before many colleges in the state valued such equity. Junior nursing major Esther Ghale and seminary graduate student Valerie Showalter offered the traditional student addresses to thank donors for their generosity. Ghale, who moved to Virginia from Nepal at age six, said her choice to attend EMU had been clear for some time, based on high reviews of the nursing program. As a student, she’s been “greatly blessed” by professors of high character, small class size, the community atmosphere, and opportunities for extracurricular and spiritual involvement, including her recent cross-cultural experience in Guatemala and Colombia. After returning from a three-year international service assignment with Mennonite Mission Network, Showalter took an online course at Eastern Mennonite Seminary with Dorothy Jean Weaver. Her calling, she says, was soon revealed. Showalter benefited from a ministry leadership scholarship, an investment both in her and in the future of the church. The donor banquet was sponsored by Sentara, BB&T and ColorQuest Custom Printing.